The following Bibles offer varying versions, translations or other functions that can make Bible reading easy for any Android user. AcroBible Lite: This is a Bible application that includes the entire text of the King James Version Bible. Includes navigation, bookmarks, keyword searches and an subject index. Amplified Bible – BibleReader: This app is a full-featured application for reading and for Bible study. You can use a ‘tap and store’ option to store free study tools. 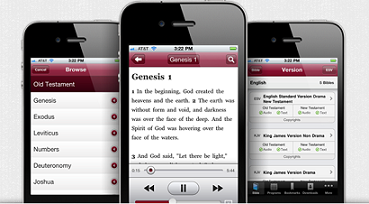 Bible: Start out with this app, which allows you to search for, bookmark and access any passage in the Bible. Translations include, but are not limited to, the NIV, ESV, KJV, NLT and CUVS. CrossConnect ESV Bible: Swipe left or right to navigate through Bible chapters. Includes audio, verse-of-the-day widget and Bible verses by reference. Hebrew Bible: This Hebrew Android app is written entirely in the Hebrew font. Use the full-Bible search, zoom in and out while reading. You’ll need a Hebrew keyboard for this app to function. LiveBible: This app includes a powerful Bible Web browser that includes four translations and supports the AMP, ASV, KJB and more. VirtueBible FE: This bible features a highlighter, flowing reading, search, history, memory and the ability to add new translations. Many of these Bible study helps include offline use, translations, commentaries, images or other helps that can support your Bible studies. Bible: Daily Light: This is one of the most popular and inspirational Bible devotional apps, with new offline Bible readings, an evening and morning study and the ability to work offline. Bible In A Year: Read the entire Bible in one year with the help of this app. Daily reading plan and weekly encouragements included. Bible Proverbs: Get offline access to complete KJV Bible Proverbs. Each verse is accompanied by Matthew Henry’s commentary. You can bookmark favorites and use a full-text search. Bible YouVersion: This Bible app includes 41 different translations in 22 languages, a one-year reading plan and a search for the entire Bible by word, phrase or verse. You also can learn from others by checking recent contributions. CadreBible: This is a free Bible study tool that includes commentaries and dictionaries that are saved to the SD card. Includes a reading plan and a backup and restore option and over 50 books available for download and offline reading. Create your own reading plan. DailyBible 1.1: This Android App starts your day off with a daily Bible verse. Read it or listen to it. Includes a daily reading plan, and you can search for any verse or topic anywhere in the Bible. Best yet – this is a free app. HolyMobile Bible Reference: This is a complete Bible reference that includes include the King James (English-language) version of the Bible, in addition to a Modern English version. No need for a concordance with this app! Mosaic Holy Bible: This app contains weekly varieties of content for reading and reflection with themes that are appropriate to the church seasons. Enjoy full-color art, scripture, historical readins, prayers, creeds, hymns, quotes and much more. MSDict Oxford Dictionary of the Bible: This accessible dictionary clearly explains the themes and doctrines of the Bible as well as provides concise information about important places and personalities. Oxford Dictionary of the Bible: Enjoy over 2,000 entries that range from Adam to Zechariah, with the ability to download the dictionary data to the device memory or to a memory card. You can download the entire dictionary to work in offline mode, too. Scriptures: This Android application offers scriptures in the KJV or LDS Standard Works. Use the bread crumb navigation trail, bookmarks and screen orientation for easy reading and study. The Message for BibleReader: This is a full-featured application for reading and Bible Study. Use widgets to learn a daily Bible verse, flashcards to help build knowledge about the Bible, and take quizzes to text your Bible savvy! Bible Widget: This widget shows a text from a King James Version of the Bible on the hour. Bible Quote Widget: This widget is a 4×1 home screen widget that provides you with random Bible scriptures. Flash Cards for Android: Use this app to create flashcards for Bible studies. You can insert the subject of learning and the relative definition (or, question and answer). Use voice definitions, too. iChristianCircle: This app helps devotees find the perfect support system from a community Christians. Get your Bible questions answered, discuss parenting, homeschooling and more with this app. SincerePrayer: This daily Christian devotional helper includes a prayer and journal, a virtual rosary and link to an online Bible. Test Your Faith Lite: Test your Bible knowledge with the most comprehensive mobile quiz available.